We only used the quality raw material in the manufacturing of PTFE Tape so that we can deliver the quality product to our customers. We bring for our clients PTFE tapes that are used in pipe fittings, plumbing, Thread joining purpose. These tapes are known for their adhesion properties and come in the standard sizes as follows. PTFE Tape is a plumber's first line of defense in stopping leaky pipe connections and making plumbing. Big advantage with PTFE TAPE that's easier to loosen the joints off if you ever want to open them and change things. PTFE makes things less sticky on the fingers and easier to remove. It is also easier to clean up an area when you've finished using the item. PTFE Tape is used for natural gas supply to your furnaces or to your water heater. It's crucial that no leakage occurs because the effects can be deadly. Commonly used in water systems such as central heating systems, air compression equipment tapered pipe threads, lubricating function, oxygen lines and some specific medical gasses, chemical & oil industries, process industries as well as architectural applications. 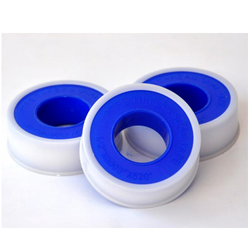 Looking for PTFE Tape ?